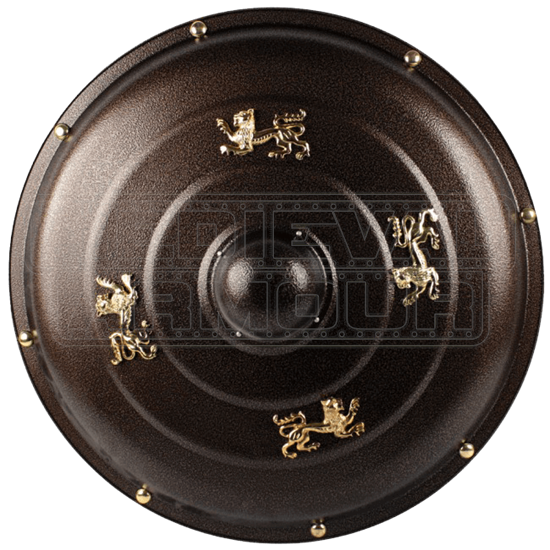 Bucklers are small shields that often accompanied a swordsman as an aid in defense. Buckler shields could be made in various shapes, including round ones like this Heraldic Lion Buckler Shield, made of quality stainless steel. At the center of this small-sized round brown shield is a small boss, secured to the shield with rivets. On each side of the boss is a golden passant lion. There is a chain on the back that allows you to easily hang this shield for wall display.